According to the church calendar, we must wait a little longer before we can hear the angelic chorus. Although we stand at the eve of Christmas, we gather this morning to celebrate the Fourth Sunday of Advent. 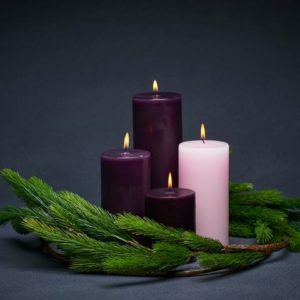 This is one of those strange years, when we light the fourth candle of Advent and the Christ Candle on the same day. We have already lit the fourth candle, which symbolizes love, and soon we’ll light the last candle, which gives off the light of God’s glory revealed to us in Emmanuel, the one born in Bethlehem. The four Advent candles, which we have already lit, invite us to live as God’s people in hope, peace, joy, and love. These are the qualities that mark the Christian life at its best. The text for today comes from Romans 16. It serves as a doxology, a song of thanksgiving, to Paul’s letter to the Roman church. This doxology lifts up the glory of God, which is revealed to creation in the person of Jesus. There is some scholarly debate about whether these are Paul’s words or represent a later editorial addition. In either case, the message seems clear. Paul has faithfully discharged his calling to proclaim the gospel of Jesus Christ to the nations, whom God desires to incorporate into the covenant people of God. This, according to the doxology, has been God’s desire from long ago, and now it has been revealed. Paul writes this letter to a church he has never visited. He wrote the letter to introduce himself and his message, because he hoped to visit them. He wants them to know that he has preached an inclusive gospel that reached out to both Jew and Gentile, so that God’s glory might be revealed through the gospel of Jesus Christ. To the connoisseur, not just sunsets and starry nights but dust storms, rain forests, garter snakes, the human face, are all unmistakably the work of a single hand. Glory is the outward manifestation of that hand in its handiwork just as holiness is the inward. To behold God’s glory, to sense his style, is the closest you can get to him this side of Paradise, just as to read King Lear is the closest you can get to Shakespeare. [Wishful Thinking, p. 35]. This glory is revealed in a word given to Mary by the angel Gabriel, who appeared to her as she lived in the town of Nazareth. Gabriel told her that she had found favor with God and would receive a divine blessing. Like the shepherds in the fields whom we meet later in the Gospel of Luke, Mary is a bit disconcerted. In the words of Luke, she is perplexed. When the angel sees her distress, he reaches out and tells her, using the King James: “Fear not, Mary: for thou hast found favour with God” (Lk 1:30 KJV) Yes, “fear not.” Katherine Norris likes the rendering of this verse from the King James, because, in her mind, it feels stronger than the NRSV rendering. It has more a sense of command than plea. “When a place or time seems touched by God, it is overshadowing, a sudden eclipsing of my priorities and plans. But even in terrible circumstances and calamities, in matters of life and death, if I sense that I am in the shadow of God, I find light, so much light that my vision improves dramatically. I know that holiness is near.” [Norris,Amazing Grace, pp. 30-31]. But, when Mary finally catches her breath and her calling becomes clearer, she sings her own song of praise to God, “for the Mighty One has done great things for me, His mercy is for those who fear him from generation to generation” (Luke 2:46-55). When we hear the word “Fear” on the lips of the angels, as they sang to the shepherds, or on the lips of Gabriel as he spoke to Mary, or on Mary’s lips, we should not hear this word as a sign that we should stand before God, our knees knocking in terror, like Dorothy’s three companions as they stood before the Wizard of Oz, fearing that God will strike us dead. No, let us remember that God is love, but it is appropriate to approach God with reverence and awe. Instead of being sinners in the hands of an angry God, we have been called children of a loving God, whose glorious presence overwhelms us. Getting back to this word “glory,” which often appears in the Bible, it can describe the nature of God. That is, glory is more than an adjective. It is a noun! So, in Exodus we find the Glory of God descending on Mount Sinai, so that Moses might experience God’s presence (Ex. 24:16-17). It was God’s glory that Moses asked to see, and which God revealed, even as God hid Moses in the cleft of the rock (Ex. 33:18-23). This Glory filled the Temple after Solomon dedicated it (2 Chron. 7:1). The Psalms often speak of God’s Glory, for as the Psalmist declares: “Blessed be his glorious name forever; may his glory fill the whole earth” (Ps. 72:19). We gather here today expecting to encounter God’s glory, which is revealed to us in Jesus. When we encounter God’s glory, we recognize that even though God might dwell within us by the Spirit we’re not God. God transcends our reality. Therefore, God transcends our imagination. The prophet Isaiah tried to imagine what God’s glory looked like. He shared a vision of the throne of heaven, with God sitting high and lifted up, while angels fly about the throne of God singing: “Holy, holy, holy is the Lord of hosts; the whole earth is full of his glory” (Is. 6:1-3). How should we respond, when we encounter God’s glorious presence? Might we join in singing: Gloria in Excelsis Deo! For God reigns on high and God’s glory is revealed so that we might gather and offer praise and thanksgiving.